IMPORTANT - Restrictions on use SAFETY: This site lies in the path of the busiest military low flying corridor in the country. THIS SITE MUST BE NOTAM'd prior to ANY MID WEEK FLYING. (Tel: 0800 51 55 44 - SITE CODE 17.078 GRID REF: NY 277 214). WALLA CRAG IS A NOTAM ONLY SITE (for ALL mid week flying before 6pm). 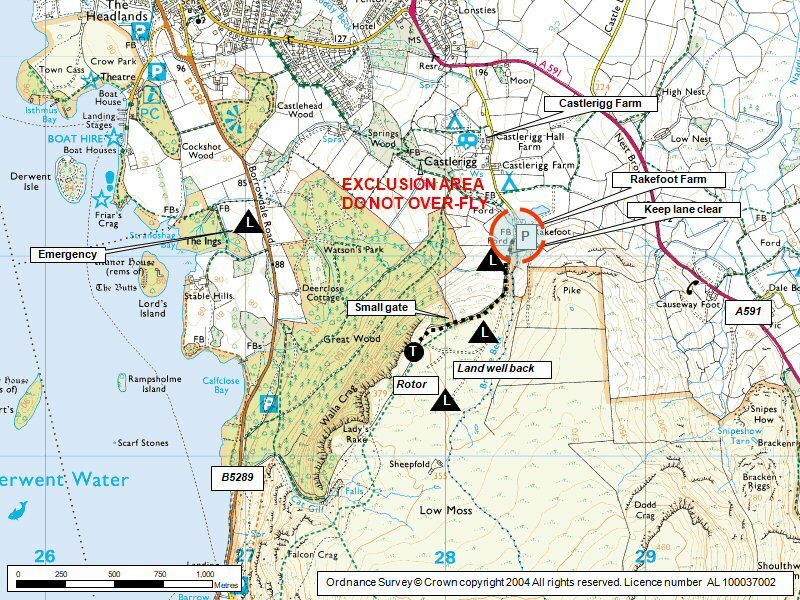 Any pilot who is known to have flown on Walla Crag 'mid-week' and has failed to carry out the correct NOTAM procedure WILL BE NAMED AND SHAMED. 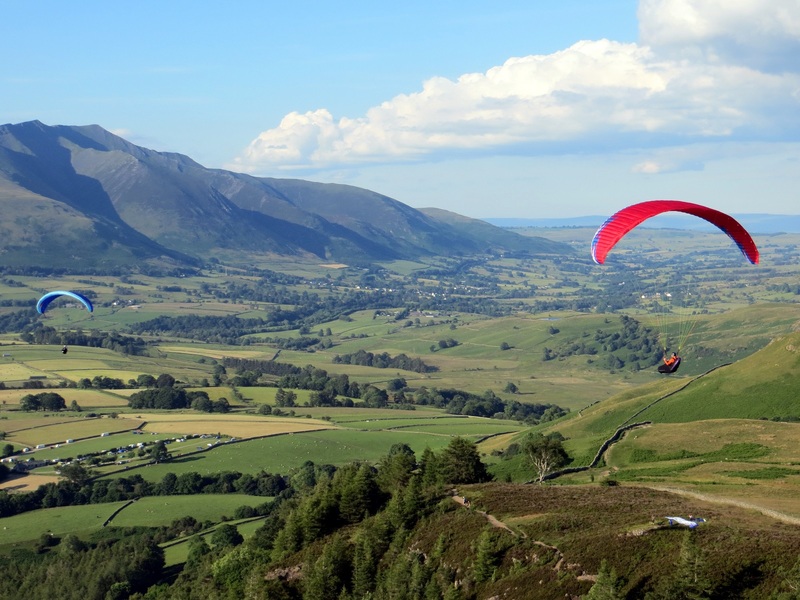 Continued abuse of the SITE RULES governing flying at Walla Crag WILL RESULT IN THE SITE BEING CLOSED and measures put in place to prevent future flying at the site. DO NOT overfly the farm buildings at any time. Keep the head of the road clear of parked cars. Use the footpath along the edge of the field to exit by. No dogs allowed on the site. An excellent light wind site; can be inter-flown with Latrigg. The cliff edge requires a take-off with conviction! Not good for nil/very light wind forward launches, due to flat top & limited space. This is a good reliable thermal site and is in the right place for convergence. Also a classic afternoon site in a gentle seabreeze. Approach from the A591. Descending into Keswick from the south, take a minor road on the left leading to Castlerigg campsite. Parking space is limited to 6 cars. DO NOT block road/access to Rakefoot Farm. There is a possibility of parking at Castlerigg campsite - a donation is required. From the road end climb the hillside heading towards the right following the line of the field boundary. The take off is 30m beyond the small gate. THIS SITE LIES IN THE PATH OF THE BUSIEST MILITARY LOW FLYING CORRIDOR IN THE COUNTRY. THIS SITE MUST BE NOTAM'd PRIOR TO ANY MID WEEK FLYING. Top land well back behind the wall - in moderate winds rotor may exist some distance back from the edge.Keep away from the trees please and do not overfly the farm. Correctly identify the take-off point. 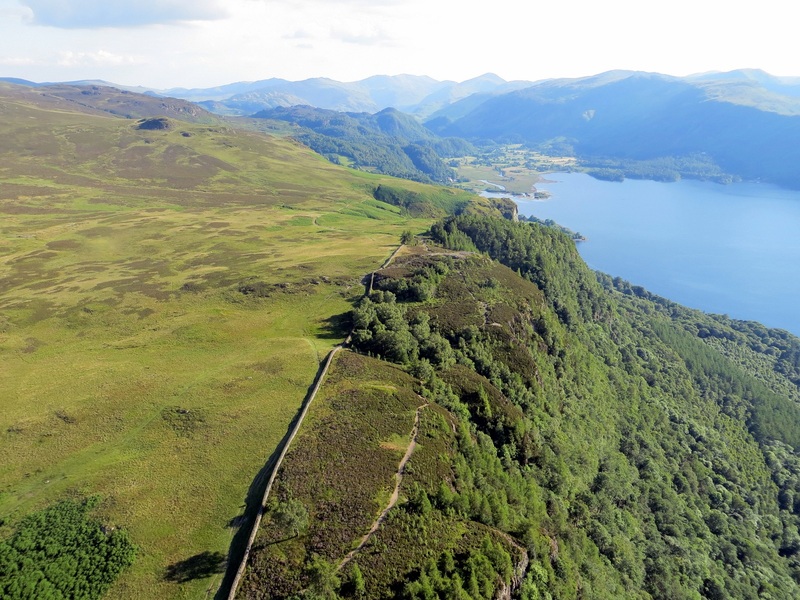 There is a small, flat heather covered rigging area in front of the wall 30m beyond a small access gate. The usual take-off is just in front of this. This is a cliff take-off requiring commitment and with no second chances. Some people choose to take off 20m further on at the slightly higher rocky knoll. Official landing field is near to Rakefoot Farm, from lane, over the gate and the stream, up the bank there are 2 fields which are connected by an open gateway. If either is empty of stock, choose that one. Good idea to check out the landing field before flying, if its your first time here. From the air, approach with care as trees near farm are now quite big. Can be lifty over these fields. If you loose height by take off, you need to make a quick decision when to turn and head for this landing field - if in doubt head out and land at the bottom. Just below take-off height top landing is possible - 100m to the right of take off (near the approach path). 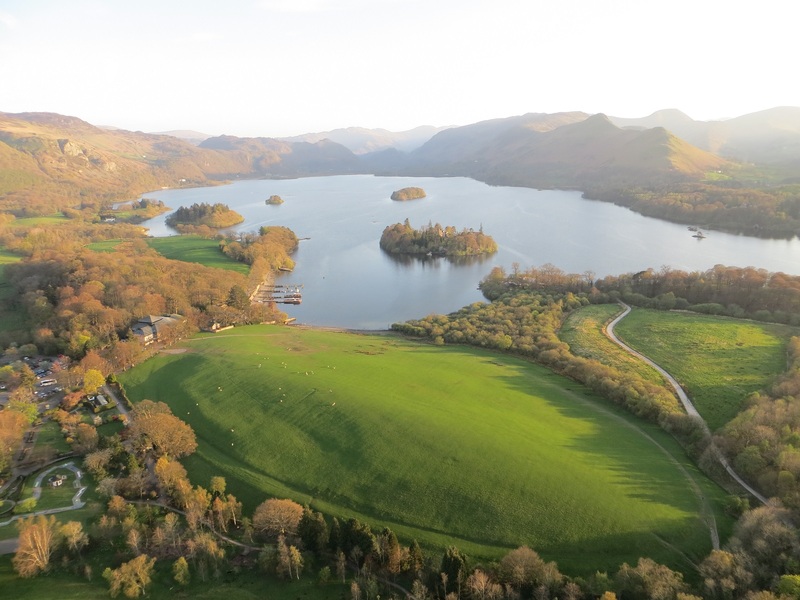 OK to land in one of the empty fields alongside the Borrowdale Road at the bottom. excellent lifty site, particularly in late afternoon sea breeze/convergence/restitution. Can be thermic. nice ridge runs down towards Borrowdale and further afield. 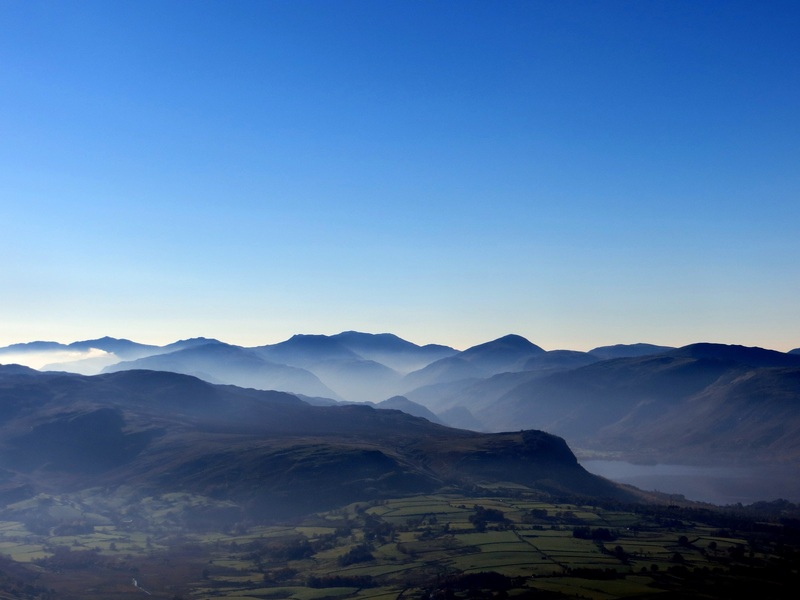 A panoramic view of the North Lakes, probably taken from the Blencathra area. Walla Crags is the steep ground with Derwent Water on its right. Photo by Mike Harper. 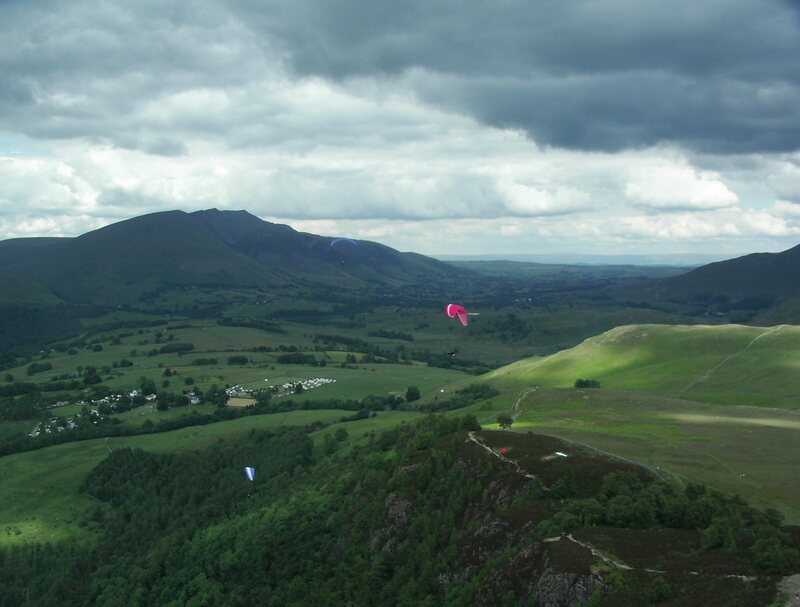 Walla Crags from the air with Blencathra in the background. 2 gliders are in the take off area. Photo by Peter Rycroft. Another view of Walla Crags looking north east. Photo by Mike Harper. Notes : The Heights aka Cragg Bar serves Lakeland Gold which is one of the best beers around. The quality of the beer is a bit variable but the beer garden is stunning and generally quiet. They have a menu of vegetarian food and out of date snacks. There's plenty of parking in their car park or the layby next to it. Midge repellent is advisable. Google Street View - Parking Keep the lane clear!